We are a nation of plenty, of opportunity, and luxury, but we are also a nation flush with fury. Homicides, assaults, domestic abuse, youth violence, and even road rage are too common, let alone everyday outbursts of temper that harm family members, friends, peers, and co-workers. The market for anti-anger, mood-stabilizing drugs is booming, as is the market for anger management counseling and classes. What is happening? 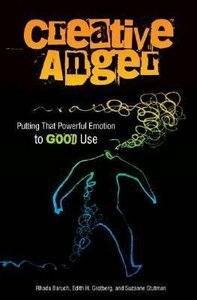 In this book, a team of experts who've been traveling the nation presenting workshops on Rethinking Anger start by telling us this: Anger is normal; nature hardwired into our brains for protection. But here is the paradox. Anger out of control destroys, yet anger understood and controlled is a constructive force, one that can be used for creativity, change, and growth. Authors Baruch, Grotberg, and Stutman show us how to take charge of this powerful emotion, so it can be used in constructive ways, rather than destructive. Using the anger energy constructively can release creative potential and be liberating. We are a nation of plenty, of opportunity, and luxury, but we are also a nation flush with fury. Homicides, assaults, domestic abuse, youth violence, and even road rage are all too common, let alone everyday outbursts of temper that harm family members, friends, peers, and co-workers. The market for anti-anger, mood-stablizing drugs is booming, as is the market for anger management counseling and classes. What is happening? In this book, a team of experts who've been traveling the nation presenting workshops on Rethinking Anger start by telling us this: Anger is normal; nature hardwired into our brains for protection. But here is the paradox. Anger out of control destroys, yet anger understood and controlled is a constructive force, one that can be used for creativity, change, and growth. Authors Baruch, Grotberg, and Stutman show us how to take charge of this powerful emotion, so it can be used in constructive ways, rather than destructive. Using anger energy constructively can release creative potential, and be liberating. Ten years of research and workshops have honed the knowledge and skills of this author team, and here they guide us to taming our anger into a positive force. This book will be useful to all trying to tame their own anger, or that of others close to them. It will also be of interest to teachers, counselors, managers and students of psychology. RHODA BARUCH is a Licensed Psychologist and Founder of the Institute for Mental Health Initiatives, now integrated into the George Washington University School of Public Health, Department of Prevention and Community Health. She has also served as Associate Dean of Harvard's Center for Research in Careers, and was Director of Career Development at Dartmouth College. Baruch was also a member of the Advisory Board for WCVB, Channel 5 in Boston. She leads Rethinking Anger seminars nationwide.